Help us stop Library@URS desk hogging! 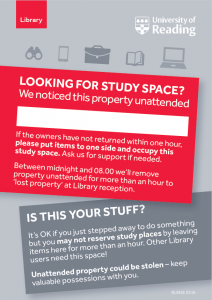 Please help us share the study space in the URS building fairly. It is fine to pop over to the Library building for a book and return to your desk within a short time. However, we think it unfair for students to reserve desks with their belongings for long periods when other students want to use that space. Sue Egleton, Associate Director, Systems & User Services.